The Klamath River will be open to salmon and steelhead fishing this year! Come see what its like to catch a fresh silver bullet in the Lower Klamath with one of our experienced Klamath River fishing guides! Its a blast drifting for salmon and steelhead on ultra light tackle! Please contact alan@alansguideservice.com to book your Klamath River salmon or steelhead trip for 2019. Thank you! 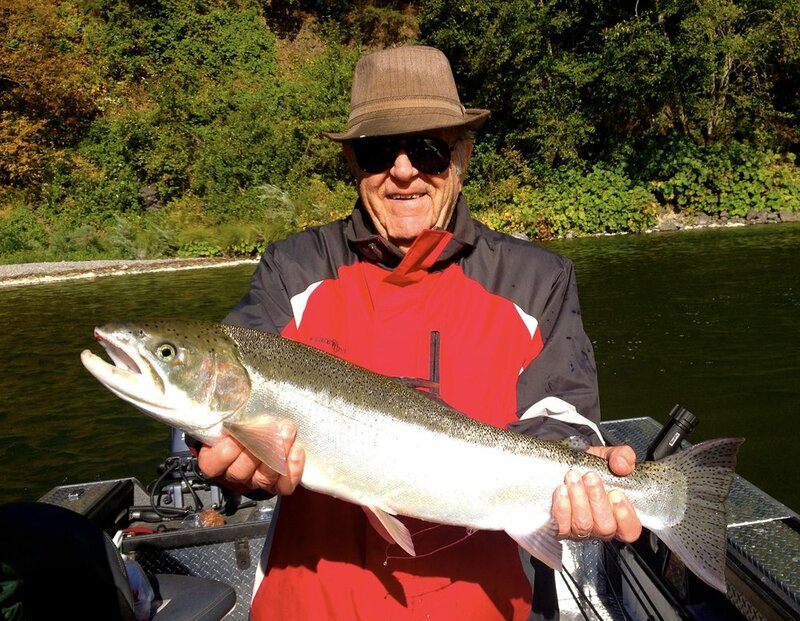 King salmon and steelhead fishing has its rush, and those who have enjoyed the experience on the Klamath River can testify to it. Perhaps it is the subtle flows of its pristine waters towards the Pacific Ocean, or the fierce struggle for freedom of the fish swimming here. Klamath River guided fishing trips have a way of turning into unforgettable adventures everyone should experience at least once in their lifetime. Silver bright King salmon on the Klamath River! The river starts flowing from Oregon, above the lake with the same name, through Ewauna and Copco lakes, through the Iron Gate Reservoir and directly into the Pacific Ocean, covering nearly 200 miles in its path. It is a world-famous salmon and steelhead fishing destination with breathtaking sceneries and rich wildlife. The most attractive and productive part of the river is its last fifteen miles. It provides excellent opportunities for those interested in watching black bears, ospreys, marine mammals, and eagles. We run our Lower Klamath River salmon and steelhead fishing trips during the months of August and September. We fish the Klamath River from its mouth at Requa to the Blue Creek drift which is located about 15 miles upstream. The Klamath River is accessible only by jet boat and for this reason, it is the fishers’ favorite destination on the California coast during the first months of fall. Great fishing destination for friends or family! The key to planning successful guided king salmon fishing trips on the Klamath River is knowing the basics about these waters and the fish inhabiting it. The salmon spring run begins in April or May and lasts until July. Fishers describe it as slow-paced and challenging, but certainly worth it. The salmon fall run begins in late August or early September, when the fish enter the mouth of the river, and lasts until late October. You can expect to catch salmon weighing from 12 to 15 pounds, although occasional catches have exceeded forty pounds. If the fish size is not that impressive, their return numbers certainly are. The most successful guided steelhead fishing trips on the Klamath River are organized between early July and early September, when the summer steelhead start their migration into the lower Klamath. Their size will range between 2 and 10 pounds, with the occasional larger caliber steelhead making it to the net. These supercharged steelhead will surely keep you busy on the water and will challenge your angling skills daily. The experienced guides know the best riffles for steelhead fishing and can get you there in shallow running jet boats. You will surely love the aggressive fight these fish present for their life and freedom, and will often go airborne when you least expect it. Given the average size of the Klamath River salmon and steelhead, light tackle works best and provides the most fun while fighting these ocean fresh fish! We use G.Loomis and Shimano spin rods for side drifting small egg clusters for salmon and steelhead on the Klamath. Our Shimano Sahara 4000 spin reels are spooled with PLine 15 CX Premium Hi-Vis line. Mad River Mfg. Hard pills are tied to our double hook leaders and we use the 3/4 oz weighted Mad River Mfg. drifter weights to get our baits down in the strike zone. Klamath Kings are a ton of fun to catch using this gear! We use high performance G.Loomis rods and Shimano reels exclusively! Are you ready to book your next klamath river fishing trip? Would you like to be accompanied by a premier NorCal fishing guide who will stop at nothing to make sure you have an unforgettable Klamath River guided fishing trip? Contact Jeff Goodwin now, and you are surely in for an adventure of a lifetime on one of the most scenic rivers in California!